Fountain House is seeking an energetic, dynamic, entrepreneurial, and experienced leader to be the next President/Chief Executive Officer (CEO) of this vital organization. Reporting directly to the Board of Directors, the new President/CEO will play the lead role in driving the growth and impact of Fountain House’s groundbreaking model of cost-effective community based-mental health programming for recovery across the region, country and globe. The next leader will be a mission-oriented strategist who will work closely with the Board, staff and members to further Fountain House’s vision: that people with mental illness everywhere achieve their potential and are respected as workers, neighbors and friends. In 1948, Fountain House pioneered community based mental health recovery for men and women with serious mental illness. Since then Fountain House has inspired the creation of programs that currently serve more than 100,000 people in 32 states and 34 countries. In 2014, Fountain House received the world’s most prestigious acknowledgement for humanitarian activity, The Hilton Humanitarian Prize, given annually to one organization that has made an extraordinary contribution to the alleviation of human suffering. Fountain House knows recovery is possible for people with serious mental illness. At its flagship program in NYC, it regularly engages approximately 1,000 people who would otherwise likely experience social isolation. It provides meaningful opportunities to live, work, learn and contribute in a community of mutual support. Fountain House improves wellbeing and empowers individuals to lead productive lives through a Comprehensive Community System of Care that integrates medical, psychiatric and social interventions. Its award-winning programs have become the gold standard in supported education, supported employment and housing. Fountain House members have an improved quality of life as well as health outcomes reflected in reduced hospitalizations and a significant decrease in Medicaid expenditures. One of the largest supported housing networks in New York State, serving over 500 members a year. As a pioneer in housing individuals living with mental illness, Fountain House operates programs that ensure that every member has a stable living environment, through Fountain House residencies, independent apartments, or with family and friends. The Fountain House Gallery and Studio provides an environment for artists living and working with mental illness to pursue their creative visions and to challenge the stigma that surrounds mental illness. A farm in New Jersey where members work in such areas as animal husbandry, gardening, building maintenance and upkeep, and fiber art. A College Re-Entry program that helps academically engaged 18-30 year old college students, who withdraw from their studies due to mental health challenges, return to college and successfully reach their educational goals. 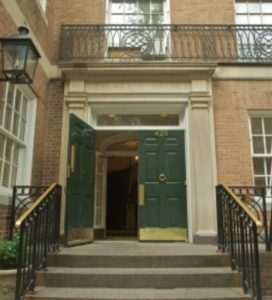 The Center for Leadership and Education helps prepare future leaders and mental health advocates to replicate the Fountain House recovery model, which has has been implemented at over 300 clubhouse programs across the country and globe. A major component of this initiative, the Colleague Training Program, features an experience-based learning environment to instruct program staff on the design and intentionality behind the model. Fountain House creates a culture that transforms lives with members, in partnership with staff, operating employment, education, housing and wellness programs. They perform all activities, including advocacy, administrative support, building maintenance and food preparation that keep the Fountain House community sustainable. Members hold jobs, graduate from schools, develop social networks, experience fewer hospitalizations and improved overall health. This leads to increased personal fulfillment with a strong sense of purpose and stability. Mental illness impacts 450 million people globally. The World Health Organization has called this the humanitarian crisis of our time. It diminishes a family’s quality of life, sometimes plunging them into poverty. The stigma is evident in several areas including housing discrimination and limited educational and employment opportunities, and it creates a domino effect of isolation and suffering that causes nearly one million people to take their own life each year. A recent report by the World Bank Group and World Health Organization, estimates the direct and indirect costs of mental illness at $2.5 trillion today. By 2030, that cost is expected to reach $6 trillion. In the U.S., people living with serious mental illness face myriad challenges, including unemployment (85%), homelessness (40%), and incarceration (24%). The National Institutes of Mental Health estimated a loss of productivity due to serious mental illness of approximately $257 billion. Although mental illness has long been ignored as a major societal issue, it is apparent that society is reaching an inflection point in addressing mental health. The Fountain House evidence-based recovery model is a proven success story that has changed the lives of countless numbers of individuals and enriched their social and workforce network of family, friends and colleagues. As the issue of mental health gets more public exposure, Fountain House is well positioned to advocate and promote the adaptation of its unique and effective recovery model to positively impact the lives of many more people living with serious mental illness. After 27 years of extraordinary leadership and service, Fountain House’s highly respected President, Kenn Dudek, will be retiring in the summer of 2019. The President position has grown and changed significantly under Mr. Dudek’s watch. The President/Chief Executive Officer (CEO) is responsible for Fountain House’s operation, long-range planning, goal-setting and execution. The successful candidate will have the ability to expand the impact of Fountain House’s community-based mental health recovery model, a background in mentoring and managing staff; an interest in and talent for fundraising, knowledge of government funding, experience with budget development and oversight, a commitment to strategic planning and the capability to partner with and further develop a volunteer Board of Directors. Most importantly, the successful candidate must have a true compassion for individuals with serious mental illness and a commitment to the Fountain House working community approach to recovery and rehabilitation. The President/CEO reports to the Board of Directors and oversees approximately 160 staff. Fountain House has an annual operating budget of approximately $20 million and the President/CEO provides organizational leadership and management for a multi-faceted and complex organization. The President /CEO works closely with the Board leadership and senior staff on key issues impacting the organization and its members. These include the engagement and understanding of state, local and federal funding opportunities and regulatory directions, elevating the revenue from private philanthropy, advocacy and communication initiatives, strategic collaborations to further organizational growth and impact, and increasing awareness of Fountain House’s recovery model. Passion for the mission of Fountain House and the capability to effectively serve as the primary advocate for the organization.